Can Ibuprofen/Advil Help with Dementia? Researchers believe that some of the brain changes in Alzheimer’s disease (AD) may be caused by inflammation in the brain. 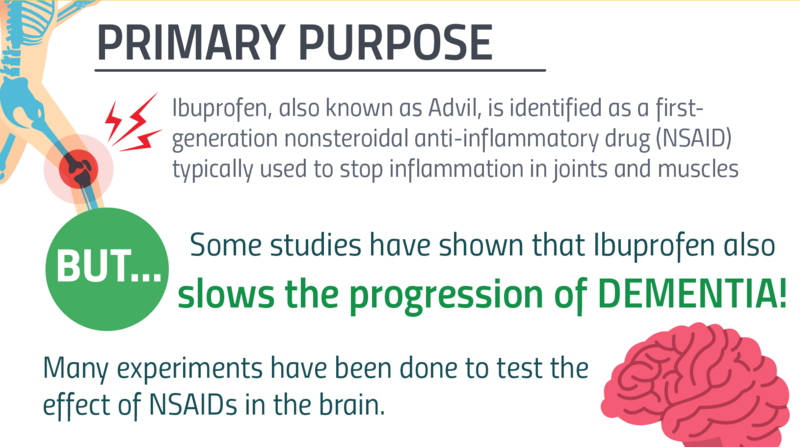 Researchers have been conducting experiments to explore the connection between Non-Steroidal Anti-Inflammatory Drugs (NSAIDs) and AD to test if NSAIDs such as Advil (Ibuprofen) will stop the inflammation in the brain that appears with dementia. Advil is a brand name of the drug Ibuprofen, which is identified as a first-generation non-steroidal anti-inflammatory drug (NSAID). Ibuprofen is a cyclooxygenase (COX) inhibitor designed to relieve pain, decrease inflammation, and reduce fever. Inflammation in the brain is caused by a different type of inflammatory response than in other areas of the body, so researchers have been studying the effect that NSAIDs have specifically on brain inflammation. The findings are inconclusive, because the blood brain barrier (BBB) that helps protect the environment of the brain is not fully understood. The FDA has not approved the use of Advil or Ibuprofen for the treatment or prevention of dementia. The recommended maximum dose for OTC strength Advil or Ibuprofen is 1200 mg in 24 hours, but doses will vary based on the pain being treated, age of the patient, and whether the patient being treated has chronic health problems. What do Leprosy and Rheumatoid Arthritis have to do with a conversation about Advil, or ibuprofen, as a dementia drug? Leprosy and Rheumatoid Arthritis are two conditions commonly treated with Non-Steroidal Anti-Inflammatory Drugs (NSAIDs) like Advil (Ibuprofen). Delayed onset of Alzheimer’s Disease (AD), the most common form of dementia, in people being treated for inflammatory conditions like leprosy or rheumatoid arthritis, raised the question about the effects of inflammation, and thus NSAIDs, on the risk of developing AD in older adults. There are many changes that occur in the brain related to AD that are not fully understood. However, we do know a few facts about the brain changes in AD: a protein called Beta-Amyloid (b-amyloid) begins to collect and form plaques in the brain, Tau proteins break down and cause tangles, and the combination of these plaques and tangles causes brain cells to die. Researchers believe that some of these changes are contributing to inflammation in the brain. The Dana Foundation (2015) compares brain changes to radio signals. If there are not enough brain cells firing, the signal is low. If the brain cells are irritated by inflammation and firing too much, the signal is too noisy. Either way, the brain cells are not communicating with each other properly and this can cause trouble with memory, understanding, and problem solving. NSAIDs, like Advil, are used to stop inflammation in joints and muscles, so researchers have examined whether NSAIDs might stop the inflammation in the brain that appears to be present in dementia. 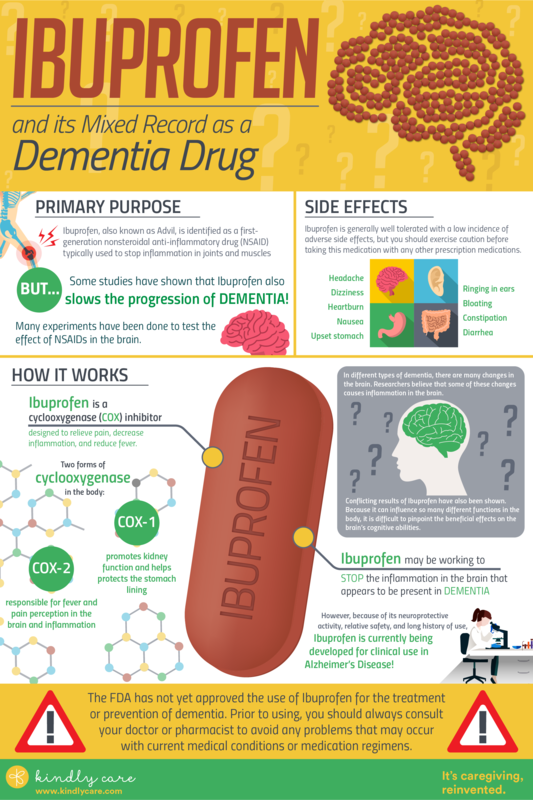 This article explores the connection between NSAIDs and AD and the current research about the use of Advil (Ibuprofen) as a dementia drug. Advil is a brand name of the drug Ibuprofen. The chemical name of the drug is 2-(4-isobutylphenyl) propionic acid (BBC, 2015). It was approved by the FDA as an over-the-counter (OTC) pain reliever in 1986. It is identified as a first-generation nonsteroidal anti-inflammatory drug (NSAID). Advil and ibuprofen are considered cyclooxygenase (COX) inhibitors. In addition to ibuprofen, this family of medications includes other drugs such as aspirin, naproxen, indomethacin, meloxicam, celecoxib and many others. The class of medications is designed to relieve pain symptoms, decrease inflammation, and reduce fever. To understand how NSAIDs work and how they differ, it is important to understand how COX works in the body, the role of the two different forms of COX, and what happens when we inhibit the enzyme COX. Cyclooxygenase is an enzyme found in all tissues of the body, and it is responsible for many important processes. When tissue is injured, COX synthesizes prostaglandin E2 (PGE2) and prostacyclin (PGI2) which cause inflammation and pain at the site of injury. These are helpful processes in beginning the healing process and alerting you to a site of tissue damage. In the stomach, both PGE2 and PGI2 help protect the stomach lining by reducing gastric acid, increasing pH of the stomach with secretion of bicarbonate, secretion of a protective mucus layer, and maintaining blood flow to the cells. In the circulatory system, COX promotes platelet aggregation (helps platelets stick together to stop bleeding from a wound) by creating thromboxane A2 (TXA2), and in the blood vessels, PGI2 causes the vessels to dilate. There is also a protective effect in the kidneys when COX synthesizes PGE2 and PGI2, and dilation of blood vessels improves blood flow to the kidneys. In the brain, COX produces prostaglandins that cause fever and the perception of pain. The COX enzyme also produces prostaglandins that help cause uterine contractions in a full-term pregnancy. Understanding the functions of COX in the body, it becomes obvious that there are some beneficial actions and some actions that can cause harm to tissues. The helpful functions that protect the stomach lining, promote kidney function, and assist with platelet aggregation for wound healing are provided by COX-1. The second form, COX-2, is responsible for more harmful processes including fever and pain perception in the brain, blood vessel dilation, inflammation, pain of injured tissue, and promotion of colorectal cancer in the colon. Aspirin is the only drug in this class that produces irreversible inhibition of COX-1 and COX-2. Aspirin is also the only drug in the class that offers protection against heart attack and stroke, primarily by inhibiting platelet aggregation. 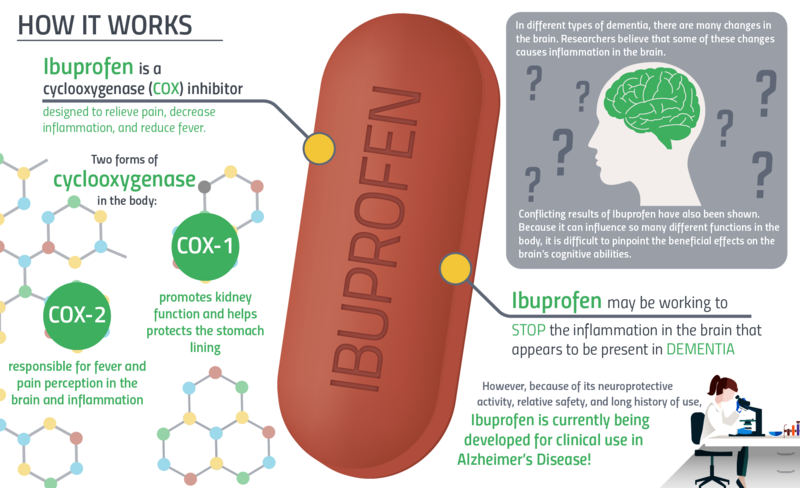 Advil and ibuprofen have a reversible effect on the inhibition of COX-1 and COX-2. When COX-1 is inhibited it causes mostly harmful effects like gastric (stomach) erosion and ulceration, increased bleeding, and impairment of kidney function. When COX-2 is inhibited it has more beneficial effects on health, such as decreasing inflammation, relieving pain, reducing fever, and protecting against colorectal cancer; but it also has two negative side effects. Inhibiting COX-2 can cause impaired renal function and lead to heart attack or stroke because blood vessels become constricted. Suppression of inflammation is one of the primary actions of ibuprofen that scientists are studying in the brain. Conflicting results from research thus far have been attributed to small sample sizes, varied health and cognitive levels of research subjects, lack of controlled variables such as family histories, age and gender of test subjects, types of COX inhibitors studied, and the duration of the studies. The fact that Advil and ibuprofen influence so many different functions in the body also contributes to the difficulty of pinpointing the beneficial effects on the brain’s cognitive abilities. In the pursuit of a cure for AD and other forms of dementia, much research has been done on the source of damage caused by the brain changes associated with AD. Inflammation in the brain is caused by a different type of inflammatory response than is noted in other areas of the body. Instead of the presence of white cells that are typical of the body’s defense mechanism, the brain has microglial cells that are the first responders in protecting the brain from injury and infection (Halliday, Robinson, Shepherd, & Kril, 2000). If these mechanisms work in a controlled manner, they help control toxic effects of dead cells or b-amyloid buildup. If the inflammatory response is over-active it can cause increased degeneration of brain cells (neurons) and contribute to increased b-amyloid plaques. In several research studies, including clinical trials such as the Alzheimer’s Disease Anti-Inflammatory Prevention Trial (ADAPT), that were performed between 2000 and 2016, there was no conclusive evidence that Advil or ibuprofen can be used effectively as a dementia treatment. Some studies do indicate that NSAIDs may have some effect on the brain inflammation created by AD changes, but all the information is inconclusive. The review findings are very unclear for several reasons. First, the blood brain barrier (BBB) that helps protect the environment of the brain is not fully understood. Scientists have not been able to effectively explain how NSAIDs affect the inflammatory response inside the protected brain environment. The BBB also effects how much of the NSAIDs get delivered to the brain making accurate dosing recommendations difficult. Secondly, there are positive and negative attributes of an inflammatory response in the brain. Positive aspects of a controlled inflammatory response provided by the microglia in the brain include clearing some of the b-amyloid proteins, and clearing debris of dead or dying cells. These clearing actions avoid buildup of toxic substances. When the inflammatory response becomes uncontrolled or chronic, there is greater loss of brain cells due to injury and death. No one has been able to identify a treatment that isolates the negative inflammatory actions. Lastly, there have not been enough large scale, long term, quality studies that address the use of different types of NSAIDs through the various stages of AD, including pre-diagnosis. To date, the best inference that can be made from the available scientific data is that treatment with NSAIDs, before a diagnosis of dementia or AD, may offer some protection and delay the disease onset. The clinical information for the use of NSAIDs after the diagnosis of dementia or AD is very conflicted, but essentially, it has shown no efficacy in delaying the progression of mental decline. Advil or ibuprofen, when taken as directed, has been proven over many years as a safe and effective medicine for mild to moderate pain, headaches, menstrual cramps, arthritis pain, fever reduction, and other symptoms of illness. It is not habit forming, does not produce a physical or psychological dependence when used on a regular basis, and can be stopped abruptly without adverse effects. However, The FDA has not approved the use of Advil or ibuprofen for the treatment or prevention of dementia or AD. In addition, prior to using any OTC medication, you should always consult your doctor or pharmacist to avoid any problems or risks that may arise with current medical conditions or medication regimens. Advil and ibuprofen are generally well tolerated medicines with a low incidence of adverse side effects. Ibuprofen has an extensive safety record, but as with any other OTC medication, you should exercise caution before taking this medication with any other prescription medications. Particular consideration must be taken before using Advil, or ibuprofen, for pain if you are already taking an anticoagulant (blood thinner) to avoid excessive bleeding. The current medical advice on taking NSAIDs during pregnancy is not to take them during the third trimester, as they may cause risk to the fetus. Anyone who is allergic to aspirin may also have an allergic reaction to other NSAIDs, including ibuprofen. 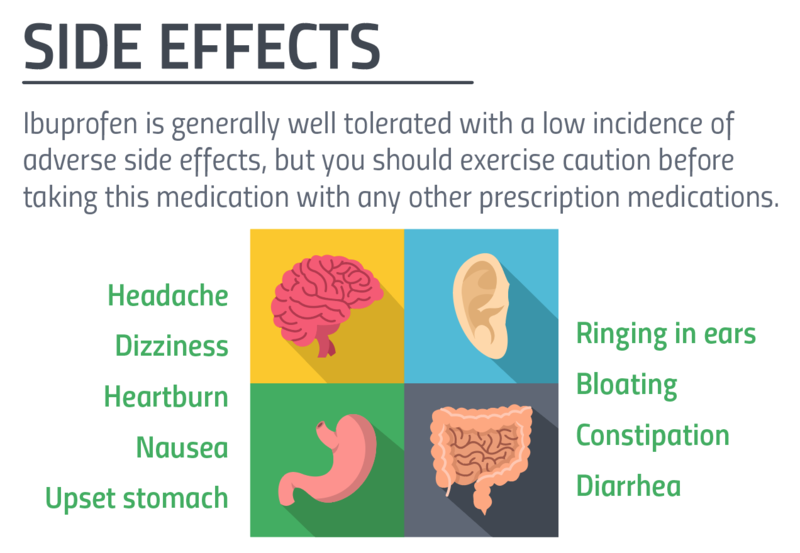 There are some potential serious side effects that you should report to your physician immediately. We will list them according to the body system that is affected. Some major side effects of the stomach and intestines include abdominal pain, nausea/vomiting, diarrhea, full feeling, blood in your stool, black or tarry stools, or burning in your chest or stomach. You should also report the following side effects that involve your kidneys, cloudy or bloody urine, decrease in the amount of urine, or dark urine. If you have side effects in your lungs, you may notice noisy/rattling breathing, shortness of breath, trouble breathing at rest or with exercise, cough, or hoarseness. You may also may experience serious side effects with your skin such as, itching, unusual bleeding or bruising, blistering, peeling or loosening of skin, or swelling in face, fingers, hands, feet, legs or ankles. Always check with your doctor or pharmacist before taking any new medications and promptly report any changes in your health if you do start taking something new. At first the doctor told David that his dad Tom was just depressed. David’s mom passed away about three years earlier, and Tom had been devastated. After being treated with an antidepressant, and helping David with some home improvement projects, Tom improved for about a year. For the last two years however, David watched his dad slowly drift away. Today, David almost lost his dad and his home. Ibuprofen may be available in the following forms: tablet, chewable tablet, liquid or drops of concentrated liquid. It is most commonly consumed in tablet form. Advil, or ibuprofen, is available in both prescription and OTC strengths. Dosage will vary based on the type of pain being treated, the age of the patient being treated, and if he or she has chronic health problems. In this article, we will only address adult, OTC dosages. Please be sure to contact your pediatrician if you are considering the use of Advil or ibuprofen in treating a child under the age of thirteen (13). Drugs.com lists several common problems that are treated with ibuprofen 200 mg to 400 mg every 4 to 6 hours. Dysmenorrhea (painful periods), fever, and mild to moderate pain are the most common conditions treated with this dosing schedule. The recommended maximum dose for OTC strength Advil or ibuprofen is 1200 mg in 24 hours. Post-surgical pain and pain due to osteoarthritis or rheumatoid arthritis usually require a prescription dose of ibuprofen and should only be taken under the close supervision of your physician. An overdose of ibuprofen can cause damage to your stomach or intestines. Therefore, it is important not to exceed the recommended doses and take the smallest amount of ibuprofen needed to help relieve your pain. If you think you may have overdosed, make sure you immediately consult with your doctor or a medical professional. Two weeks after almost losing his dad, David is admitting Tom to a memory unit close to his home. David asked Tom’s doctor about starting his dad on a daily dose of Advil, or ibuprofen, after reading that ibuprofen helps patients with dementia. Tom’s doctor informed David that there were no conclusive studies that ibuprofen is beneficial in improving cognitive ability in patients with dementia. At this point, without FDA approval, the doctor feels the risks for Tom’s health, far outweigh any potential benefits in trying to treat his dementia in this way. Tom’s doctor did point David to a website that provides information on clinical trials for Alzheimer’s disease: http://www.alz.org/research/clinical_trials/find_clinical_trials_trialmatch.asp This site may have a clinical trial that would benefit either his dad’s late stage dementia, or help David prevent development of dementia in the future. David decides to let his dad get settled in to his new home before pursuing any new medications or any clinical trials. As discussed earlier, it is crucial to seek medical advice from your doctor or pharmacist before beginning any new medication. This is especially important when you take other prescription medications. Drugs.com notes 423 drugs that have known interactions with ibuprofen, including 102 major drug interactions. It is also important not to stop any current medications without talking with your doctor. Your primary care physician is aware of your medical history and is the best source of information when wanting to start a new medication. Always discuss all of your medications (OTC and herbals treatments too!) with your doctor to help you avoid dangerous drug interactions. Current research is inconclusive about the benefits of Advil or ibuprofen on the cognitive abilities of individuals with dementia. Some of the research is pointing towards prevention of inflammatory changes in the brain that are caused by the plaques and tangles associated with AD, but there has not been enough evidence to draw that conclusion. However, the FDA has approved the use of Advil and ibuprofen for the safe and effective treatment of mild to moderate pain symptoms. Until more studies find support for benefits of NSAIDs for brain health and dementia, Advil (ibuprofen) is generally not recommended as a dementia treatment. See our article on dementia treatment for other options that may be more useful. Burchum, J. R., & Rosenthal, L. D. (2016). Lehne’s Pharmacology for Nursing Care (9 ed.). Spokane, WA: Elsevier.